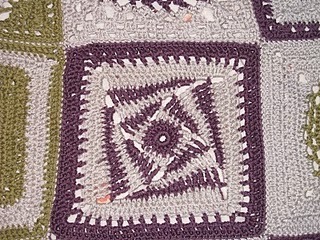 If you’ve been reading this blog for any time, you know that I’m not a fan of joining a lot of motifs. However, every now and then, I run across squares (or other motifs) that make it worth the effort to weave in all those loose ends. Lately, I’ve discovered a number of squares that really ‘speak’ to me. Here they are. Let me know what you think about them. Wouldn’t this one make a pretty something for Christmas? I LOVE motifs with those ‘twisty’ middles. If you know of others, I’d love to have a link. I love the cat with the tail and the spiral the best. But I have done some of these before. JUst did the Wooleater a couple of weeks ago. I like your selections. WOW! Thanks for sharing. I love the cat. I’m going to get off this silly computer and make some right now. 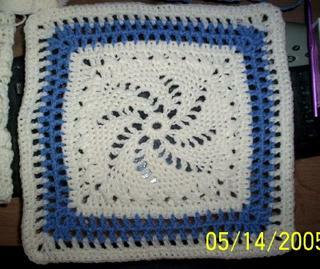 Thank you for posting these granny squares. Had saved the last one in my computer then lost it-computer crashed. I like the twisted patterns and the cat is just adorable. Will be using these patterns in projects soon. 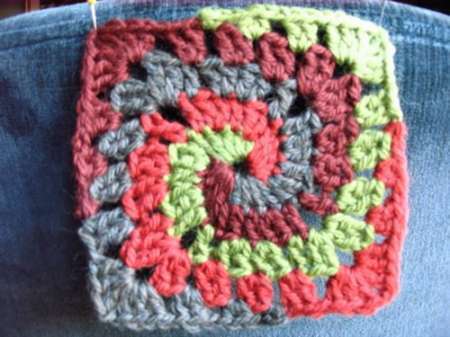 I loved the crochetme four-colored spiral square so much that I kept going and made a baby afghan from it. Such a clever pattern. I love the top one and the last one – I imagine an afghan made by alternating those two would be really cool – if eyewatering! 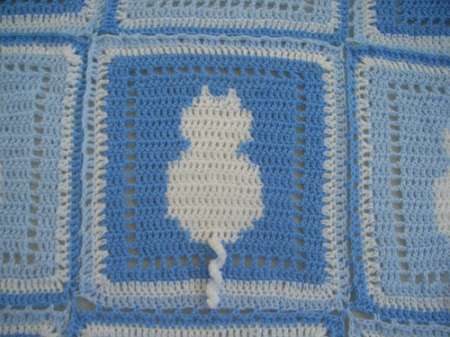 what a cool idea for a babyghan. Can you post a picture? What colors did you use? They’re all really nice. 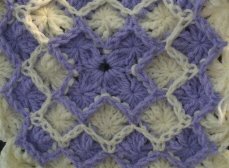 I want to do something with granny squares sometime, but I find they make me nervous. Also, the picture of the square above the cat square was taken on my bday, coming next week Friday 🙂 Just thought that was interesting. HEY BOOKWORM, why do grannies make you nervous? One really nice thing about crochet is that you can usually just rip out your mistake and have a ‘free’ do-over. The trick to grannies is going around the ‘corner’, I think. Once you get that down, the rest is pretty mindless unless you choose to change colors often (fun) or do one of the ‘crazy’ squares like the tilted one shown above. Hope you’ll abandon your fears and try some grannies. They are fun. 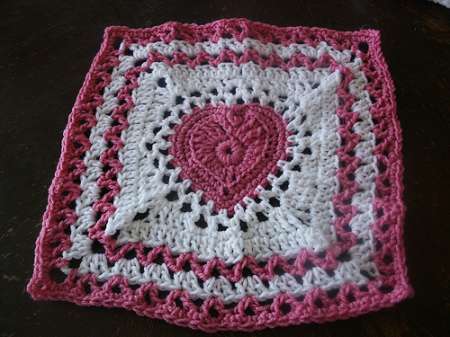 Make one really large granny for a babyghan or lapghan. Glad I got that cat square for your bday! Email for granny help if you need to. Or, better yet, youtube it.